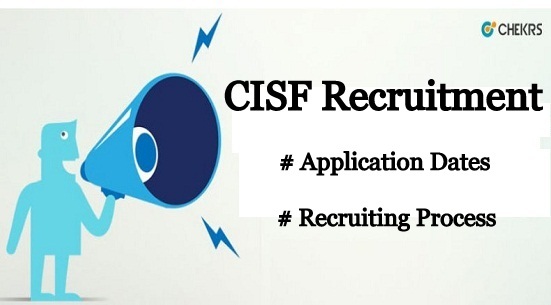 CISF Recruitment 2019: The Central Industrial Security Force Ministry of Home Affairs has soon announced the appointment notice for the enlistment to the post of various Sportsman and women Posts. The candidates who are interested and eligible for CISF Sports Quota Vacancy 2019 they can apply for Online Application Form on or before the last date. Before applying candidates should read the complete notification to know the important recruitment details including important dates, how to apply, selection procedure, exam pattern, syllabus, eligibility criteria, educational qualification, and more information. The CISF Sports Quota Recruitment 2019 Online Form link is available on our website. Latest Update: CISF is going to release the Sports Quota Recruitment 2019. Interested & Eligible Candidates can check all the details from here. The Central Industrial Security Force has been released Assistant Sub Inspector and Head Constable Recruitment 2019 Notification on the official website to fill up the Sportsman and Women vacant posts. Candidates who are interested in CISF Head Constable Vacancy 2019 can apply for the vacant seats. Candidates can fill the application form on or before the last date. Before applying, candidates must read the official notification and follow each instruction about the eligibility which is given below. Assistant Sub Inspector (ASI) Bachelor Degree from a recognized University with Good Academic Marks. Head Constable/ General Duty 10+2 or equivalent from recognized institutions/Board. For ASI Post: The Age between 20 to 25 Years as on closing date. For Head Constable: The Age between 18 to 23 years. ASI/ Exe–Level-5 in the pay matrix 29,200 to 92,300/-(Pre-revised Band Pay 5200- 20200+ Grade Pay 2800/-) plus usual and admissible allowances to the Central Government employees from time to time. HC/GD- Level- 4 in the pay matrix 25,500 to 81,100/- (Pre-revised Band Pay 5200- 20200+ Grade Pay 2400/-) plus usual and admissible allowances to the Central Government employees from time to time. SC/ST and Ex-Servicemen candidates are exempted from application fee. The interested Male and female candidates who meet the eligibility criteria they can send their filled and signed application form along with a certificate in a fever of SC/ST to the office of CISF. For more details, candidates can download the official notification Pdf which is given above. Candidates whose applications are found in order will be put through the following selection procedure. We are going to update all the details related to CISF Sports Quota Recruitment 2019. If any candidates have facing problem in Application Process so send Comment through comment box we will give a satisfied answer of it.